Solomon W. Golomb was the first to systematically examine the Pentominoes. He defined them as areas composed of 5 squares of equal size, with each of these squares being connected to a different square on at least one side along its entire length. Since there are 12 possible combinations (except for symmetry), there are also 12 pentominoes. He gave them letter names, which I also use on this website, as you can see at the top of this page. So the Pentominoes are originally pure 2-dimensional objects. If you use cubes instead of squares to form the individual pieces, you can also assemble 3-dimensional bodies, such as cuboids. Strictly speaking, they are no longer pentominoes. On some pages on the web dealing with Pentominoes you can find the information that the game originates from ancient China. 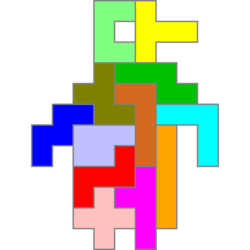 The variant of the Pentomino game with a 13th piece was called “Game of Life” because there are so many possible solutions for the 8×8 square that one life is not enough to find it. 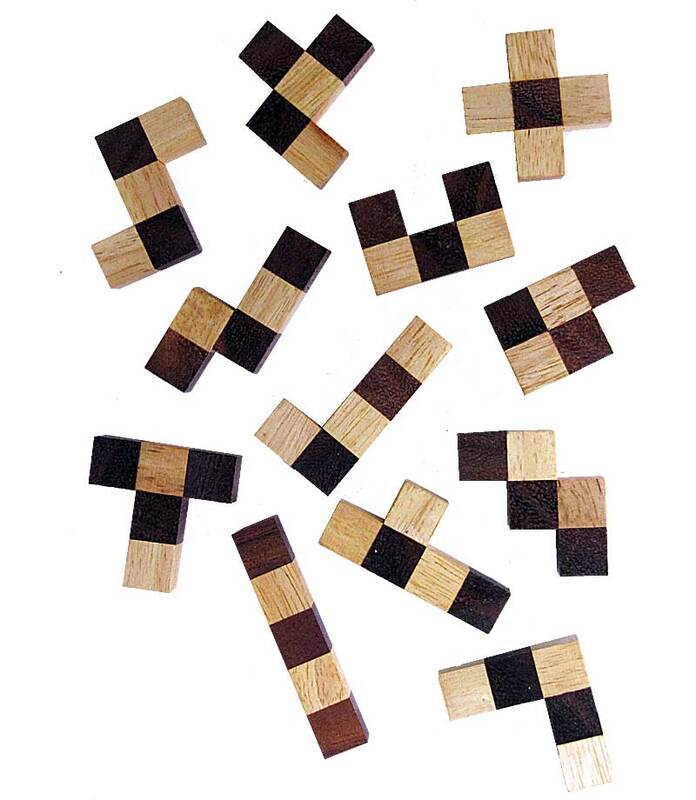 Solomon W. Golomb also wrote in 1965 in “Polyominoes” that old masters of the Go game already used Pentomino pieces. In 1907 the book “The Canterbury puzzles and other curious problems” by the English puzzle inventor Henry Ernest Dudeney was published in London. 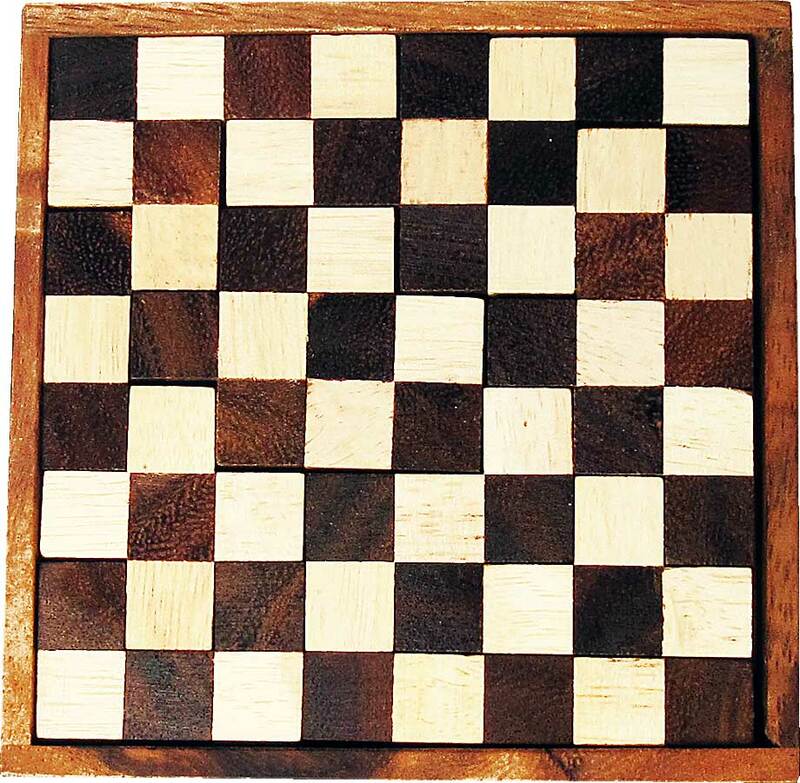 The 74th of the 114 brainteasers is about a chessboard broken into 13 pieces. The task now is to reassemble these pieces to a chessboard. A drawing of the 13 pieces is shown in the book. 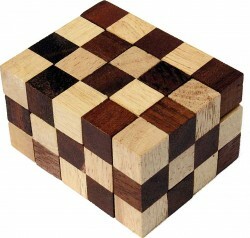 There are 12 pentominoes with chessboard pattern, supplemented by a square stone consisting of 4 squares. The inventor of the name Pentomino is the American mathematician Solomon W. Golomb. He first used the name in 1954 in an article in the journal American Mathematical Monthly. Through him and above all through Martin Gardner’s books and columns in the journal Scientific American, the Pentominoes became known. Since that time, many people all over the world have been occupied with these objects. You can use the Pentominos to build 2- and 3-dimensional pieces with a chessboard pattern by alternately coloring the cubes of a pentomino piece light and dark or by gluing together the pentomino pieces made of light and dark wooden cubes. 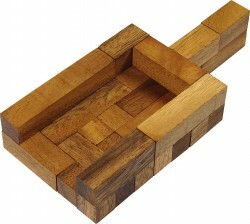 This considerably reduces the number of possible solutions per piece and makes the puzzle even more difficult. 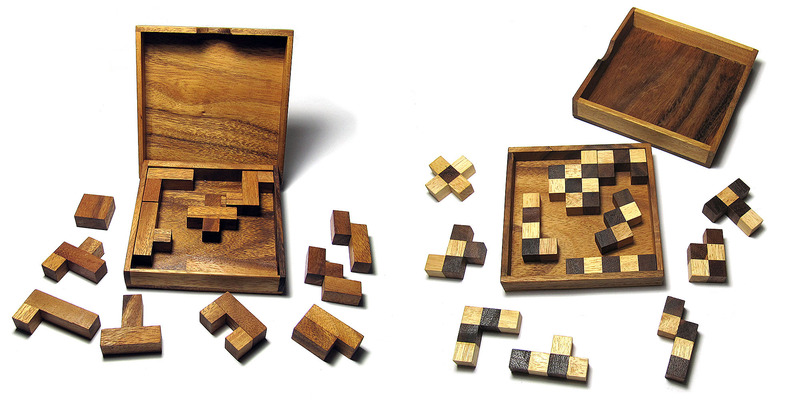 For each pentomino piece there are 2 different ways to create a checkerboard pattern. 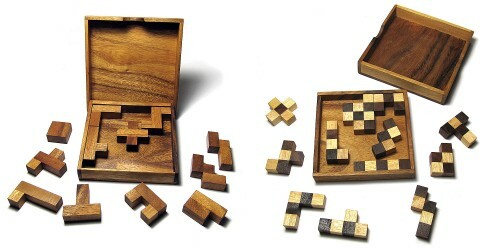 Thus there are also many different sets of pentominoes with chessboard pattern. For the set of pentominoes of the illustration I have given the number of solutions for some pieces in the table. 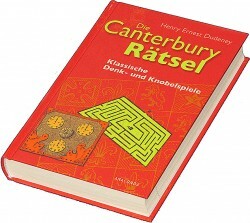 On the download page there are 2 solution programs for pentominoes with chessboard pattern available. 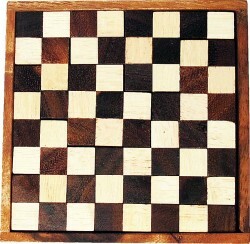 The chessboard pattern looks very nice, but for many pieces there are no more solutions.